Hydrogen is a diatomic molecule, two hydrogen atoms sharing a valence shell. You can fill a balloon with hydrogen and oxygen gases and they will not instantly form water. To get water out of this you need to ‘excite’ the sets of hydrogen and oxygen atoms sufficiently to ‘unstick’ them. Strike a match and with an earth shattering ka-boom later (well it is loud, maybe not earth shattering) you have water. 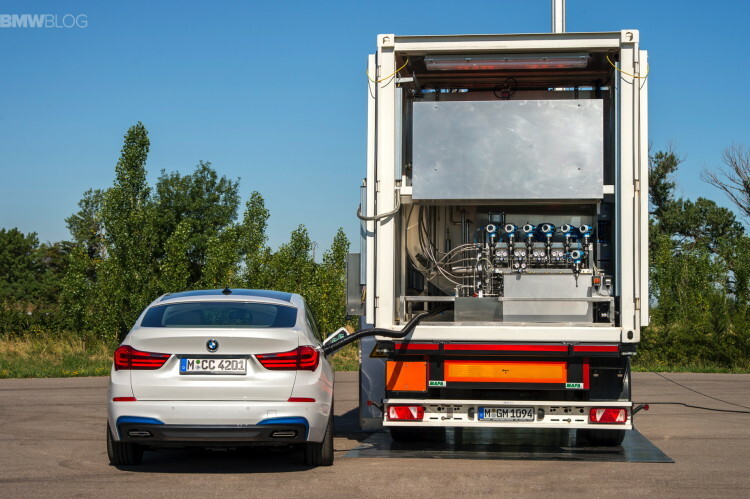 And using hydrogen in a combustion chamber mixed with air is pretty straightforward (and remember it’s a 2 to 1 mix of hydrogen and oxygen – and air contains roughly 21% oxygen), and BMW has been down this road before with a hydrogen fueled IC engine 7 Series. However, there is a problem with hydrogen as a fuel source for an IC engine. While it has incredible energy density per pound – about three times that of gasoline, it unfortunately is the lightest element in the universe, meaning that it has to be squeezed mightily to get any density at all. Even compressed hydrogen doesn’t come close to the energy density of gasoline by volume. So, given the low efficiency of an IC engine compared to an electric motor, hydrogen isn’t an effective solution. But when comparing compressed hydrogen to batteries the tables turn. Hydrogen in a fuel cell stack can provide plentiful electricity allowing decent power and range. And even better, unlike batteries, as the store of hydrogen drains the fuel cell stack still produces rated voltage. Batteries decrease available voltage as they drain (and that’s why so much effort is spent on battery management and not allowing batteries to discharge beyond a very healthy reserve). The big problem with fuel cells to this point has been their cost – the materials and expertise to build them are not cheap. But like a lot of technology, as it is developed the costs should come down. Toyota, among others, uses a solid polymer membrane fuel cell – also called Proton Exchange Membrane (PEM) fuel cell – and one suspects that BMW will use a solid polymer membrane fuel cell as well. 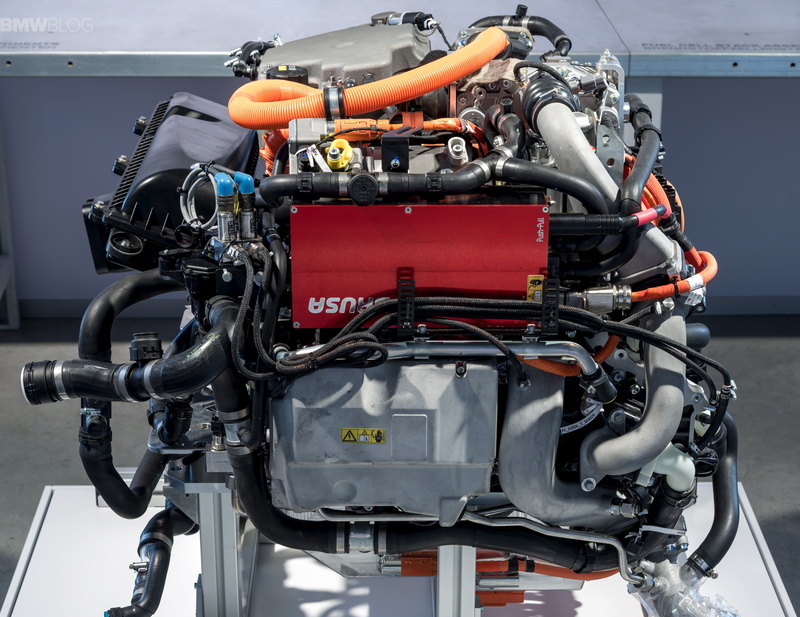 The PEM fuel cell is between 40% and 60% efficient (it requires power to operate) and runs at temperatures equivalent to an IC engine’s coolant. What happens in the PEM fuel cell is that electrons are stripped from outer valences of the atoms and the resulting positively charged atoms are combined (two hydrogen and one oxygen atom) to form water. The stripped electrons are used in the electrical circuit and provide power for a motor to drive the vehicle. 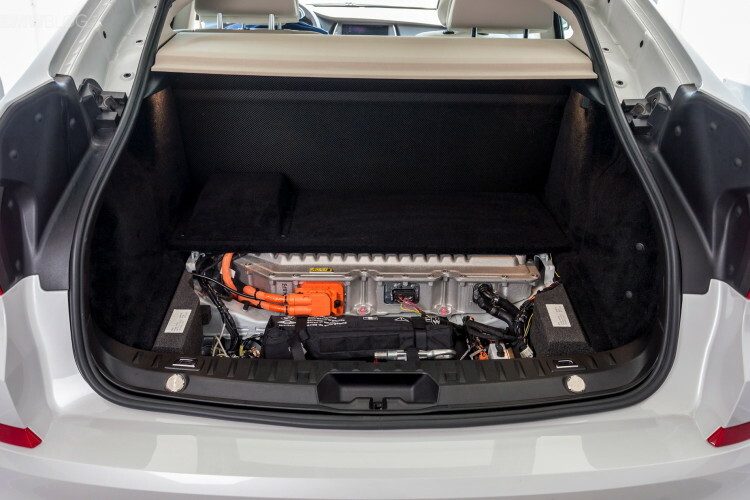 The fuel cell is backstopped with a battery pack to act as a buffer, collecting regenerative braking energy and absorbing unused output from the fuel cell and ‘starting’ the fuel cell. The Toyota Mirai, for example, stores its compressed hydrogen in two carbon fiber storage tanks. While hydrogen is flammable, the big issue from a safety perspective is pressurization. Hydrogen, being the lightest element tends to escape rapidly. But if a storage canister is punctured the escaping compressed gas will cause havoc while it demonstrates Newton’s third law of motion. The other current complication is the state of the hydrogen infrastructure. Hydrogen requires substantial energy to isolate, compress, and contain. But when those issues are resolved the electrification of the automobile will be bright. The fuel cell vehicle has the promise of efficient electric operation that also provides the range and rate of refueling that drivers expect.